I, Daddy, from Daddy and the World’s Longest Poo, would like to thank the academy for this most auspicious of accolades. 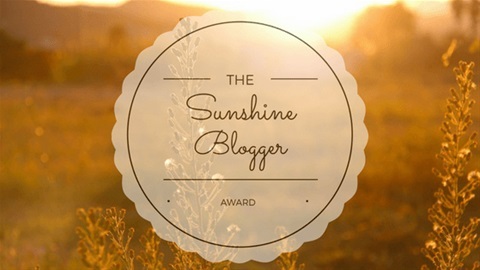 My author, Brydie Wright, would like to take the credit for this Sunshine Blogger Award but without my character, she’d be nothing and her book wouldn’t be the success it is (or could be one day). But even I must give credit where credit is due. Without a nomination from Kim M Watt, blogger extraordinaire, my blog may well have been overlooked. Kim’s own interview for the Sunshine Blogger Award, won on behalf of Layla, the world-dominating cat, is one of the most entertaining I’ve seen in recent years. I read it on the loo where all my best thinking is done. And It is now my pleasure to carry on the Sunshine Blogging tradition and answer the interview questions Kim M Watt wrote for me, before my author can get a word in. i. Is your author disproportionately cruel to you, or does she enjoy embarrassing you for comic relief? Yes, I think my author is cruel to me. Everyone deserves a bit of privacy when they are in the loo, bathroom, toilet – whatever you want to call it. For some of us, it’s a haven; a world away from our troubles. Can’t a grown man have five minutes’ peace without his author holding his bowel movements up for public ridicule? ii. Are you named for someone in your author’s life? Why? My name is Daddy. I have a sneaking suspicion that my author must have had a daddy like me at some stage or maybe even a husband. The more I think about it, it’s probably the latter. She seems to have a lot of ideas about why husbands spend ages on the loo. She thinks we are doing some sort of gigantic poo but it’s just secret men’s business and there’s nothing funny in that. Just good harmless reading, thinking or listening to our iPods. iii. What quirks has the author given you that you really wish they hadn’t? Where do I start? My author portrays me as this secretive dad hanging out in the toilet for hours on end, neglecting my domestic duties. When have I ever done that? Can I help it if nature calls, or I just need some time out? I’m a regular sort of guy and when you need to go, you need to go. iv. Do you feel confident that you’re going to make it into a sequel? Why/Why not? v. How do you justify not doing what your author tells you to? Pass. I seem to always end up doing what my author wants me to do. vi. What is one thing about you that your author has edited out/is going to edit out, but you’d like to tell us? Well, I think it’s important to say that my wife is not perfect either. Sometimes I catch her hiding from my son, watching The Bold and the Beautiful in bed. You know what they say, people who live in glass houses shouldn’t throw stones. We all have our own ways of trying to find a little peace. vii. What’s the most interesting thing about you? Maybe you should ask my son. He follows me around everywhere, even when I’m in the toilet. He’s always asking me questions. I think what you could say about me is I know when to take five and just breathe. I think it’s important for everyone to find their own place to meditate and have some ‘me’ time away from the family. The toilet is that place for me. It’s usually very peaceful, until my son discovered my hiding place. viii. If you’re not the protagonist, do you wish you were? Why/ why not? My son seems to be the protagonist but I think I steal the show. After all, it’s called Daddy and the World’s Longest Poo, not The Little Boy Who Wonders What His Daddy is Doing in the Loo. That title just wouldn’t work. ix. Do you have a sidekick or helper? Who are they? My son is my shadow, my sidekick and my helper. One day he’s going to grow up just like me… he’ll appreciate the toilet too. x. What would you like to tell your author? When I was having some quiet thinking time on the loo the other day, I came up with 10 questions and I’d love for my nominated bloggers to interview any one of their characters in either a completed work, or WIP. What genre did your author write you into? What makes your character a great fit for this genre? Do you agree with all the choices your author makes for you? Being a literary type, we really must know – are you a cat, or a dog person? Does your author play favourites with her characters? Where do you fit on this spectrum? If you could choose a love interest from the other characters in your book, who would it be and why? If you could choose a name for your own blog and write about what you know and love, what would it be and why? Do you have any plans to take over the world? What do you think your author’s best qualities are? If you could speak directly to your readers, without the author as a middleman, what would you like them to hear from the horse’s mouth?